The Senate is considering a rules change that would help put an end to Democrats blocking President Donald Trump's judicial nominees. Democrats have been using an existing Senate rule requiring 30 hours of Senate floor debate on most of President Trump's nominees. At the current rate of the Democratic obstruction, confirming the president's nominees will take about 9 years! As of today, only 3 Senators have cosponsored the resolution, and Senate Majority Leader Mitch McConnell has refused to bring it up for a vote. Urge your Senators to sign on as cosponsors to S.Res. 355 to put an end to the Democratic obstruction. The chart below indicates how Democrat Minority Leader Chuck Schumer has weaponized the rules to obstruct the nomination process. 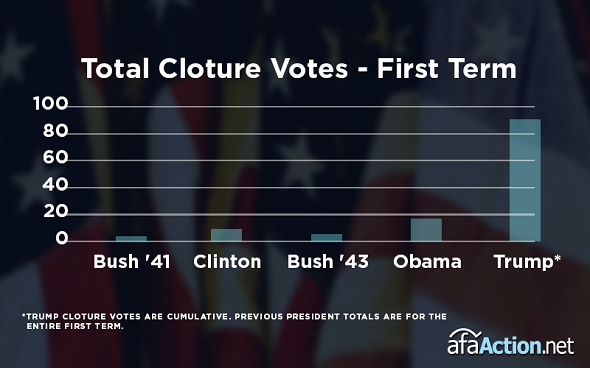 Republicans have had to invoke cloture at least 89 times to end filibusters by Democrats. This is a stark comparison to the number of times cloture was invoked in the past: George H.W. Bush (0), Bill Clinton (7), George W. Bush (0), and Barak Obama (17). Click here for more on the Democratic obstruction. Unless Senate Republicans sign on to this resolution and press Senate leadership to take it up, Democrats will continue to obstruct the nomination process and President Trump's judicial nominees will be blocked. Again, urge your Senators to sign on as cosponsors to S.Res. 355.